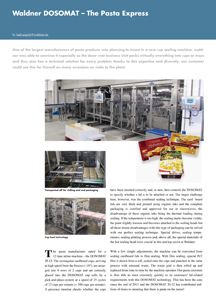 The pasta manufacturer opted for a 12-lane inline machine – the DOSOMAT 20.12. The rectangular cardboard cups, arriving at high speed from the freezer (–18°), are arranged into 6 rows of 2 cups and are correctly placed into the DOSOMAT cup cells by a pick-and-place-system at a speed of 25 cycles of 12 cups per minute (= 300 cups per minute). A presence monitor checks whether the cups have been inserted correctly and, in turn, then controls the DOSOMAT to specify whether a lid is to be attached or not. The major challenge here, however, was the combined sealing technique. The card- board lids are very thick and printed using organic inks and the complete packaging is certified and approved for use in microwaves, the disadvantage of these organic inks being the thermal loading during sealing. If the temperature is too high, the sealing marks become visible, the paint slightly loosens and becomes attached to the sealing heads but all these minor disadvantages with this type of packaging can be solved with our perfect sealing technique. Special drives, sealing temperatures, sealing printing process and, above all, the special materials of the hot sealing head were crucial in this and top secret at Waldner.